One of the most popular water activities nowadays is standup paddle boarding; it’s a friendly water sport that allows all water enthusiasts from different age ranges and interests to enjoy and benefit from a full body workout anytime and anywhere. 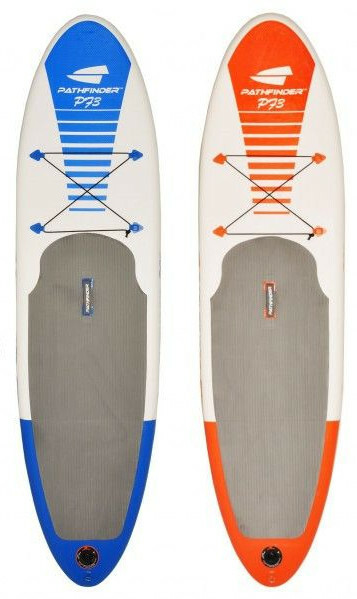 To start standup paddle boarding, all you need is a good inflatable SUP in a nice package. There has never been anything more practical than getting one of these boards to start enjoying your summer time. 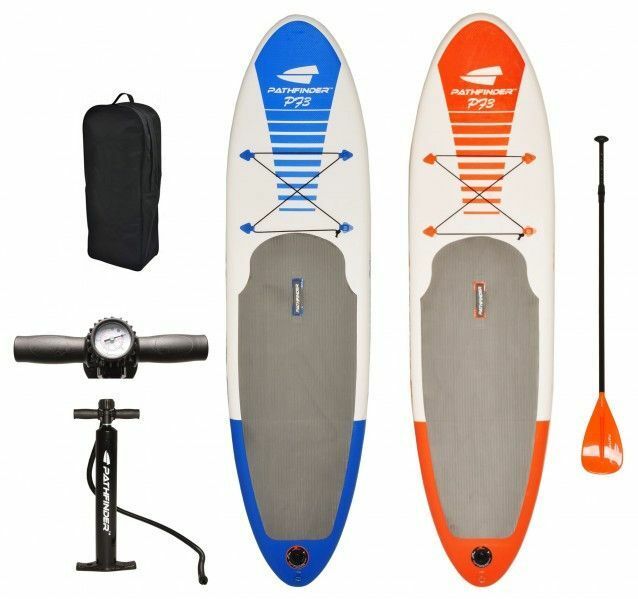 In this review, we’re glad to present the solid Pathfinder P73 inflatable stand up paddle board that is great for entry-level paddlers. The Pathfinder P73 is not a huge inflatable paddle board, but it’s absolutely big enough to take up to 240 lbs which could be a fully grown adult. This board measures 9.9 feet in length which we may consider to be a 10 feet (almost). It’s a very functional dimension if you ask me; a 10 feet board is easy to handle, easy to transport and inflate/deflate. As for width; this board is 30 inches wide which is the standard norm for most quality inflatable paddle boards. This exact width is enough to keep anyone balanced on top of the board in different water conditions. However, a beginner might need a little time before getting a full grasp of the whole sport which’s only normal. The last thing to point out concerning measurements is the thickness of the Pathfinder P73. Some iSUPs are only 4 inches thick which is okay sometimes. This board, however, is 5 inches thick which performs better when it comes to sturdiness and steadiness. Almost every quality inflatable stand up paddle board is made of the same famous and durable material. The Pathfinder P73 is not an exception; this board is made of heavy-duty military grade PVC material that turns extremely stiff once the board is fully inflated. This material makes sure that the board is capable of taking some beating when it gets a little rough. Also, the multi-layer drop-stitch technology makes it possible for this board to stretch and inflate up to 15 PSI without losing shape even after years of being used. Such technology help preserve the inner shell of the board while the PVC material prevents anything from the outside to get through. All in all, it’s a rigid inflatable paddle board that is built according to the universal quality standards known for inflatable stand up paddle boards. The first thing to notice about the Pathfinder P73 is the choice color. It comes 2 different colors; blue/white and orange/white and both look pretty nice and neat. The traction pad on this board is gray and it covers half the board’s back; it’s grippy, soft and adds to the thickness of the board. Next, you’ll find 4 D-rings on the deck and they are connected with the usual bungee cord to perform as a storage area. Another 2 D-rings are on the board’s tail for anyone who likes to keep it safe and use an ankle safety leash. To facilitate transporting the board, the Pathfinder P73 is featured with a central carry handle that’ll allow you to one-handedly carry the inflated SUP with ease and comfort. And finally, the navigation system consists of one large removable fin that does a good job keeping a straight tracking in flat water. A high pressure hand pump with gauge. A neat carry backpack to store the whole thing. As you can see, there is no repair kit included but it won’t be a problem with hopes that you’re going to be a friendly user. The Pathfinder P73 is an all-round iSUP that is great for recreational paddling and touring. I’ve had a pleasing experience trying this board especially in terms of balance and how responsive it was. This iSUP is definitely made for beginners given its dimensions; I’m not saying that it’s small or can’t handle skilled riders; but I just think that it’s better suited for entry level skills. The Pathfinder P73 is not the fastest iSUP you’d come across, but it still glides on flat water smoothly with minimum effort. The featured paddle does a great job given the very affordable price for the whole package. The Pathfinder comes in a nice and neat package. It’s easy to handle by beginners. It performs nicely in different water conditions. The only thing that could be considered as a con is the missing repairing kit which you won’t need if you take good care of the board.